When I’ve experienced feeling stuck during a lesson or training session, I like to end on a positive note by giving my horse a leisurely groom, plenty of love, and a bucket of healthful grain before turning her out to graze and roll and frolic. Sometimes I’m back within a few days to try again, but other times my instincts tell me a longer break is needed to reflect on what’s holding us back, and whether to focus on getting beyond the barrier or taking a different approach. With most lessons learned from horses, there’s also a valuable lesson for other areas of life. 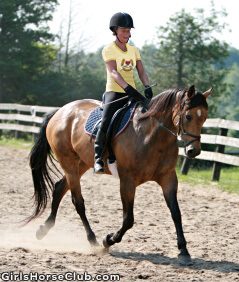 It’s these lessons that inspired Girls Horse Club more than ten years ago, and continue to guide me in all I do here. I know I’m speaking in metaphors, but also know horse girls will understand why I share these thoughts as we’re about to go quiet, with just the sounds of horses and other critters scurrying about this virtual barn. With all this philosophizing and reflecting, I can’t possibly kick up my hooves and gallop off without expressing thanks for the gift of horses and all they do to inform and inspire our growth — not to mention the FUN we have together! As so many of you point out in your writing, what would we do without these amazing creatures in our world? Let’s make sure we never have to answer that question. And let’s never forget our gratitude for the gift of horses. And horse girls? I have a strong belief that you’re capable of anything you set your heart and mind to. You’re talented, intelligent, insightful, kind, generous, courageous, strong… I could go on, but you get the picture. I’m thankful for all the amazing young and not-so-young horse girls who have touched my life. Until our trails cross again, keep reading, keep writing, and keep horsing around! 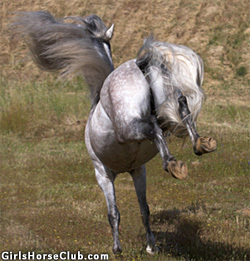 Champion blog Leadmare.. now i feel like kicking up my hooves in spirit! =0) Remember that introduction story activity you talked about not too long ago? I think where you or someone rights a story promt and then the girls write the next chapter? After break do you think we might try it out? HAPPY THANKSGIVING Mates! This is probably one of the best blogs I have ever read. Life is truly full of challenges, but it’s full of rewards too. We can’t have one without the other. Hey Leadmare, when does the Girls Horse Club break end?? I’m looking forward to reading more stories and poems and gettin more news nibbles from you guys. And I’m sad that the break is coming so soon after Wild’n’Free showed me this awesome place. Well, until later: Happy Turkey Day, and please, please keep this place up and running even while we’re all on break. Thanks for everything, Leadmare. You’ve kept this place alive, even through the breaks and pauses and the times when no one submits anything. I’m giving thanks for all of you guys and, mostly, Leadmare for beaing so awesome and supporting all of us! Happy Thanksgiving! Thanks for the nice comments and thoughts. Whether I worked hard to earn my blessings or was just plain lucky, I’m eternally grateful! Regarding questions about and suggestions for the future of GHC, I’m not making any promises but when the break begins I’ll post a page with general info and answers to frequently asked questions. Enjoy the day with your two and four-legged loved ones! This is a truly good blog. I love it! Wow! LM that was so good! Wow WesternMare, I bet that’ll be fun!! Good luck! Dear LeadMare — What a wonderful blog & I hope you feel the virtual hug (and nudge and nicker ; hug, horse-style) I’m sending for all you do for the world of girls & horses! I’m grateful to all you other horse girls, too. You make my life and that of many horses so much better. Hi Ms. Farley! good job leadmare! That’s some powerful reflection, LeadMare. Life is a steep climb, a challenge, but the priceless lessons we learn from horses make it so much easier. I’ll really miss GHC, but I’m planning to come on every day regardless, and I’ll be truly thankful each time. I’m going on a writing camp for the on-coming days, and I know what I’ll write about ;) Maybe there’ll be a challenge there. I owe everyone thanks for inspiring me. I hope everyone can embark on their own horsey adventures during the break and really indulge in the world of horses. Best wishes to all! Madelaina, I’m very grateful to you and Julia for all you’ve done to make GHC such a special place. You both set a high bar for Junior Bloggers — not just in your writing, but in the way you interact with and support the other girls. You’re both so humble about your talent and generosity, yet confident enough that you don’t need attribution. But I don’t want your behind-the-scenes efforts as Junior Editors to be overlooked by all the writers you support here. So thank you, thank you, thank you from the bottom of our hooves. Have a great time at your writing camp! Terri, thank you for the kind words and big horsey hugs back atcha. I’m SO thankful for the not-so-young horse girls I’ve met through GHC, and happy we’ve had the opportunity to meet and exchange (human) hugs in the real world. ;) You’ll always be a valued part of GHC. awesome blog lm! does anyone know if there will be another writing contest like last time, cause that was sooooo fun! i just wanted to ask. anyway, everyone have a great thanksgiving break, and God bless you! Leadmare, and all the other Girls Horse Club girls out there, no matter what happens, we’ll always be there for each other, right?!?!?! **big virtual hugs, nickers, and nudges** Thanks, guys, for giving me a warm welcome when I arrived and for accepting me as one of you. LeadMare, thanks for everything you’ve done, and I hope that you continue to run this place just as expertly! I enjoy talking with you girls, and I just want to thank you guys for that. WHEN I COUNT MY BLESSINGS, I COUNT YOU GUYS & THE HORSES TWICE!!! Happy Thanksgiving and Merry Christmas…… and I hope we’ll meet again. Western Mare, we’re in the same boat. I’m working with a green horse starting tomorrow!!! This is going to be a great experience for both you, me, and the horses we ride! Great job…keep it up…and I hope we meet again. I’ll see ya later. Keep in touch, guys. cool blog!,by the way i keep changing my name for the seasons,but sadly there’s no such thing to b a horse luvr where i live!thats why im going crazy of being solitary for a very,very,very long time ever since i could remeber,overall i luv the idea of this blog! Very cool blog! I will be sad to see GHC take a leave of absence for a month or so, but can’t wait till then! This break is going to be good for me. I should be able to find time to write something for ya’ll. I have just been sooo busy with the horses lately, and I’m about to start working with ANOTHER green horse. Enjoy the break everyone! Cool, Jumper! Well I guess this is the last day of GHC before the break.. When we come back I’ll let y’all know how the training went… The horse is a Lipizzaner breed (my ultimate fave breed ever!!) 4 years old, has been abused by a neglectful Dressage rider. So I’ll be training her in Western and might try her over some low 1ft jumps.. Its a great feeling to know your helping a horse that has had a bad passed.. Well, joyful whinnies to you all! That’s awesome, WesternMare! I’m real sad that GHC is gonna take a break real soon, but I have a feeling it’ll give all of us (who have the opportunity) a chance to go and ride those horses like real riders!!! Yeah! the horse I’m trainin is a black gelding who is still green, only about seven years old, and has had slow training….my trainer Erica has been sooo busy with collage and stuff…she hasn’t had the chance to train the poor boy! So I’m gonna start him in english and hopefully get this bad boy on the road! I hope we can be great friends, WesternMare. Thanks for the nicker, Rochlia! See ya’ll later…..and i’ll hope to keep in touch! Man, I wish there was a way to exchange emails…..but we’re not allowed to post personal info….too bad. See ya’ll later….happy thanksgivin and merry christmas…may your holidays be filled with joy and love from human and horse alike! Jumper-how cool that you’ll get to train a horse…that’s a big responsibility but it’ll help you two to bond. I wish that GHCers could email each other too, but there are a lot of freaks scanning the Web who might use our personal information to their advantage. Scary thought. I’m glad that Leadmare prevents any personal information from surfacing! haha, Texas is the best state ever. Tell your cousin that it rocks. Go Aggies. Leadmare, I read your blog again and I stick to my comment that it is the best. Truly the best. I’ll miss all of this until break ends! Thank you to everyone for all the kind words and good wishes. I wish you a Merry Christmas, Happy Hanukkah, Joyful Solstice, and generally blissful season of celebration and peace. If I could, I’d send a special horse to each and every one of us who is dreaming, hoping, praying, begging and pleading for a four-legged friend to give you wings (oh, and the means to care for that horse for the rest of his/her life — because we all know getting a horse is just the first step…).